Coming in hot with Mario at a low price. Nintendo of America have announced that a new 2DS bundle is coming this August. 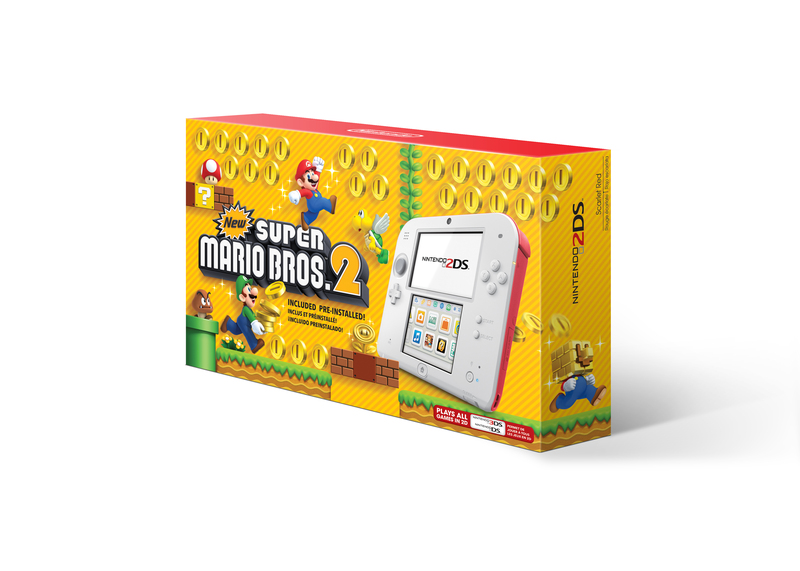 The bundle will include a white-and-red 2DS alongside a pre-installed copy of New Super Mario Bros. 2 for a great low price! The bundle will go for the very friendly price of $79.99, giving you the ease of being able to pick up the great backlog of already released 3DS games for the system. You can play the newly released Miitopia and Hey! Pikmin for your system. How about Super Smash Bros? The elusive Pokemon Sun and Moon? Getting creative with Super Mario Maker? The possibilities are nearly endless. The bundle releases on August 25th in North America. You can currently pre-order one on GameStop’s website. REDMOND, Wash.–(BUSINESS WIRE)–Even though summer break is over in a matter of weeks, it doesn’t mean your summer adventures have to end. With the Nintendo 3DS family of systems, incredible adventures through amazing worlds are always at your fingertips. ← Pokémon Is Making A Nostalgic Return To Cinemas This November With Pokémon: I Choose You!